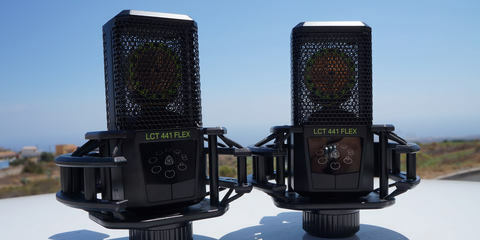 The LCT 441 FLEX is LEWITT’s latest large diaphragm condenser microphone, squarely aimed the mid-level section of what is by now a very crowded and competitive market. Like all other LEWITT numbers, it is not meant to imitate the voicing or the styling of a coveted vintage mic but it is a thoroughly modern design that aims to provide the best possible sound quality and performance for the money. The FLEX in the name refers to the unusually vast amount of polar patterns available at the push of two buttons. 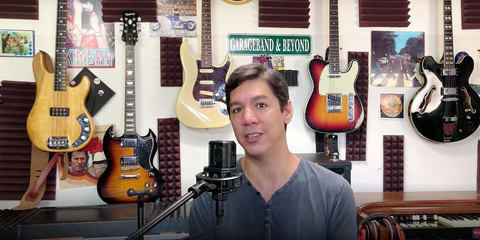 We have, going clockwise from the bottom: Cardioid, Wide Cardioid, Omni, Reverse Wide Cardioid, Reverse Cardioid, Supercardioid, Figure of 8 and Reverse Supercardioid – quite a few more than normally available on most multi-pattern mics, and with a few unusual choices that might leave some confused. The reversed polar patterns are surprising but can be genuinely useful in a number of ways: you can switch the mic from, say, overhead to room duty at the touch of a button, or when close micing a cab you can have the display and buttons pointing towards you, which makes it much simpler to check it’s status at a glance. I also found it useful to use the reverse cardioid pattern when recording backing vocals: it gives you a more hollow, roomy sound that seats easily behind the main vocal - and the singer doesn’t have to go through the humiliation of doing a take through the back of the mic. In terms of build quality, the LCT 441 FLEX is rock solid, with a monolithic zinc alloy body and upper mesh from which the one-inch capsule can be seen peering. The body is shorter and stouter then all my other LEWITTs – this is a good thing for me because it makes for easier placement in confined areas. The LCT 441 FLEX is based on the design of LEWITT’s record-breakingly quiet LCT 540 S (which I reviewed a few months ago). Though it doesn’t feature that microphone’s ultra-low self-noise, which would be impossible at this cost and probably not possible at all given the multiple patterns, the specs are very good: 144 dBSPL means that the fact that there isn’t a pad will not practically matter, and a signal to noise ratio of 87 dB is more than good enough for most real-world application. The self-noise figure of 7 dB (A) is very respectable. The diaphragm is a one inch 3-micron gold sputtered Mylar thing. The LCT 441 FLEX comes in a cardboard box, rather than the super solid military grade case that accompanies the more expensive models, but you get that excellent semi-circular shock mount (why don’t they all design them like this?) and a very portable magnetic popper stopper. There are also some familiar LEWITT extra functions: the logo turns red when the microphone clips (which with that 144 dB SPL tolerance means that everyone should run for cover because something very bad is happening) and there is a Key-lock function activated when holding any of the buttons for two seconds: the logo becomes non illuminated and the buttons become inactive until you deactivate the Key-lock by pressing again for 2 seconds. If you mainly record yourself and you don’t have any self-destructive, evil multiple personalities, you probably won’t need to use the Key-lock. It could, on the other hand, come in very handy in larger sessions involving compulsive random button pushers - I’ve been there. Speaking about the buttons, they feel positive and not at all spongy, with a nice firm click. It’s good that they have included two rather than just a single one, because with so many choices of patterns having to constantly go “the full circle” could easily become tedious, particularly if you mistakenly overshoot. This microphone sounds very good, regardless of the relatively low cost. I’ve tested it on a session with Maggie Casey and Johnny Be, London folk musicians extraordinaire who play, amongst other ensembles, in the very popular group The No Frills Band. Maggie and Johnny will record an album as a duo in my little audio boudoir during the winter and they graciously accepted to record a demo of their track Fire Thief (originally a Karine Polwart song) by overdubbing with a single mic rather than playing together as they normally would. 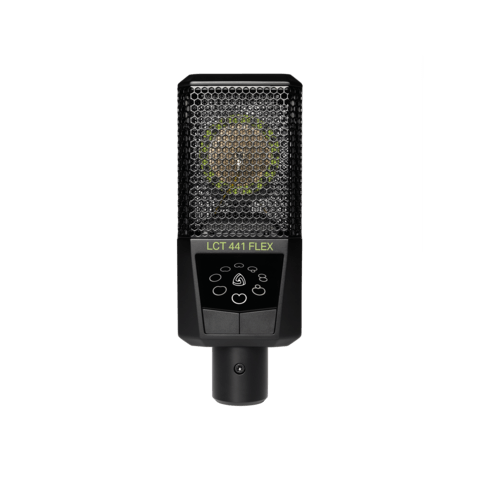 The first thing that comes across is that the LCT 441 FLEX makes for an excellent vocal microphone. Maggie’s voice is a quintessentially English folk, very rich and melodic mezzo-soprano and the mic handled it beautifully. The LCT 441 FLEX has the familiar LEWITT voice, big and clear without sounding artificially toppy. The instruments we recorded were Johnny’s Appalachian dulcimer plus a very nice Hokema Kalimba (never heard such a good sounding thumb piano, even though in this case we ended up using for some very understated embellishments), a shruti box and a tin whistle, both played by Maggie. Another thing that was immediately clear is how well defined the polar patterns are. The Omni pattern, in particular, is a joy to use, which is not always the case with large diaphragm condensers. LDCs achieve omni directionality by using two electrically connected diaphragms, which in lesser designs can lead to an uneven sensitivity in different areas of the pattern. I have found the same excellent definition in my other Lewitt multi pattern LDCs, the LCT 940 and the LCT 640 TS, so whatever their designers do to achieve this - they are doing it right. I used the omni pattern on every instrument because it sounded so natural in my very well dumped instrumental booth. What I was hearing from the monitors in the control room was very much what I was hearing in the booth - just perfect. On Maggie’s lead vocal I went for the cardioid pattern for some proximity effect, and for Johnny’s backing vocal I decided to try the reverse cardioid, to see where it would take us. It worked well for backing vocals and Johnny was very amused to hear such a roomy sound whilst still singing to the front of the microphone. Here is the demo mix (we’ll definitely re-record this track with a multi-mic setup to avoid making it sound too different to the rest of the album). This was also one of my first mixes done in Harrison Mixbus 32C. I ended up using way fewer plugins than I do when mixing in Logic: any eq came from 32C’s channel strip, which is wonderful, and I also eschewed from using other than the built-in compressors, which are also really good. Effects were a UAD RE-201 on the dulcimer and tin whistle solo, a touch of UAD EP-34 tape echo on the main vocals, a UAD Dimension Dused as a send for the Shruti box. On the two buss, I made an exception and went for a UAD Neve 33609 compressor, which works well for this kind of music, plus a little smiley curve on 32C’s master eq. A rich and present take that responds really well to any eq and takes compression beautifully. 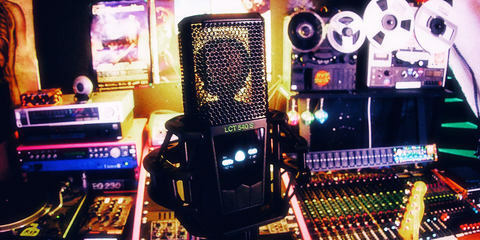 The LCT 441 FLEX makes for a superb vocal microphone, and would also excel at podcasting. Johnny's Appalachian Dulcimer is the sort of instrument where the LEWITT sound works it’s magic best - it could easily sound shrill and I’d normally turn to a ribbon mic for something like this, but no traces of anything unpleasantly edgy here - just the natural, organic sound of the instrument. Recorded in omni. The Tin Whistle solo is also a lovely summer peach. I did almost nothing to it in the mix – a bit of low cut just from habit, two dbs of 10k with the Harrison eq and the Space Echo. Recorded in Omni. The Shruti Box was also recorded in omni, with the mic behind Maggie’s sitting position, a meter or so over her shoulder. I did nothing to it except a bit of low cut - Mixbus 32C’s high and low filters are very sweet and quite addictive – and a send to the UAD Dimension D to “stereoize” it a bit. This is an instrument I’d normally record with two mics but even the mono take sounded rich and full. With a street price around 380 Euros, the LCT 441 FLEX will go toe to toe with some strong mid-market microphones, for example, the marginally more expensive AKG C314 is a clear contender. I can’t imagine the LEWITT lacking in sound quality and performance next to the AKG. 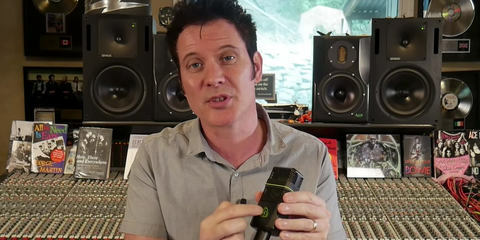 In terms of built quality they are on the same level and though the AKG features a pad and a high pass filter, the LEWITT has some extra features, a very slightly better self-noise figure and more polar patterns, some of which will appeal to the more creative sound engineers, designers, and recordists. If you are looking for a flexible instrumental microphone I would recommend the LCT 441 FLEX wholeheartedly. If you intend to use it primarily for recording your voice, the usual caveat of having to try it first applies – no one can tell whether it will deliver the sound you have in mind but yourself.